A black and white large format negative of Tammy Calderone sitting on a table and holding an airplane. This photograph was taken on October 12, 1947. 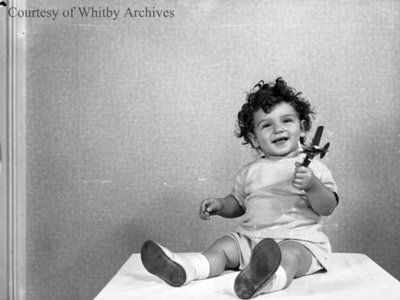 Tammy Calderone, October 12, 1947, Marjorie Ruddy. Whitby Archives A2013_040_387.